Summary. In November 2016 Director of R.E. 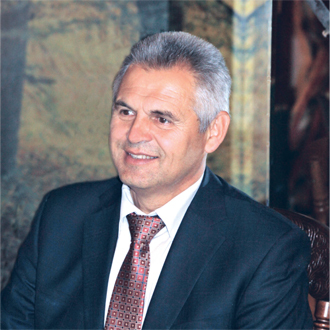 Kavetsky Institute of Experimental Pathology, Oncology and Radiobiology of the NAS of Ukraine, Editor-in-Chief of “Experimental Oncology” Academician of the NAS of Ukraine Vasyl Chekhun celebrated his 60th birth anniversary. The origin of cancer remains one of the key problems of the developmental biology. At the turn of the century, the tremendous progress in molecular oncology accelerated the evolution of the concepts of the mechanisms of malignant transformation allowing one to develop the novel strategies for eliminating cancer cells. Several generations of scientists including our contemporaries have been engaged in designing virtual, theoretical and experimental models that may be advantageous for discovering the secrets how to approach the essential of the challenging problem of cancer. Since oncology is closely interlinked with physiology, the research in physiology and pathology at the level of cell as well as the whole organism is of paramount importance for understanding the exact nature of the malignancy and applying effectively the up-to-date technologies for diagnosis and treatment of cancer. The strategy for developing and designing the new generation of targeted anticancer drugs based on the use of vector system and nanotechnologies is of the utmost significance for finding solutions to urgent problems of cancer treatment. Looking back at the progress in science one should always remind of those personalities who generate the novel ideas and who are in charge of the successful research teams capable of turning the ideas into reality. Academician Vasyl Fedorovych Chekhun who is a dedicated doctor, a romantic scientist, a philosopher, a man of marked individuality is undoubtedly such a personality. Vasyl Chekhun graduated from O.O. Bohomolets Kyiv Medical Institute in 1980 and as a promising graduate was officially recommended to start his career as a researcher at R.E. Kavetsky Institute of Oncology Problems (nowadays R.E. Kavetsky Institute of Experimental Pathology, Oncology and Radiobiology of the NAS of Ukraine). Really, it was decisive of his fate to start his carrier in those far-off sixtieth at the Institute founded by its first Director, the famous Ukrainian oncologist and pathophysiologist Academician R.E. Kavetsky. From the first days, Vasyl Chekhun, then young graduate, was inspired by the creative atmosphere of scientific work and the high professional excellence of the research team. His first tutor in science was the talented researcher, the Head of the Pharmacokinetic Department, Prof. Halyna Kulyk, who impressed the young scientist by her talent and wisdom and contributed to the formation of the scientific worldview and creativity of the young research fellow. At the Department, Vasyl Chekhun with his colleagues were engaged enthusiastically in studying multipurpose monooxygenases as one of the key elements involved in metabolization and detoxification of cytostatics. It was demonstrated that both cytostatics and the factors of endogenous intoxication in tumor-bearing host inhibit significantly the activity of the key enzymes of detoxifying system affecting the biotransformation of the therapeutic agents. As a part of the study aimed at improving the approaches to anticancer therapy, the methods allowing for increased selectivity of cytostatics by modifying the activities of microsomal oxidation enzymes have been elaborated. The thiol-containing specific sorbent that eliminates the salts of heavy metals was selected upon screening the substances capable of inducing the activity of the inhibited enzymes and decreasing toxicity of cytostatics. These experimental studies provided the strong framework for the use of sorption detoxification as the supporting therapy in cancer treatment with cytotoxic agents. In 1986, Dr. V. Chekhun defended his PhD thesis in onco­logy “The influence of thiosorbent K-2–9 on toxic and antitumor effects of cis-dichlorodiaminoplatinum in experiment” summarizing the results of his experimental studies. In 1994, Vasyl Chekhun defended his doctoral thesis on the role of the plasma membranes in the mechanisms of realization of cytotoxic effects of the coordination substances of platinum. The results of this study laid the groundwork for further research in the field of drug resistance and personalized treatment. And these subjects became dominating in research activity of Vasyl Fedorovych. Working at the Institute, Dr. V. Chekhun rose through the ranks from young entry-level researcher to the Director of one of the well-known Institutes of the NAS of Ukraine. In 1997, he was awarded the academic title of professor. In 2000, he was elected the corresponding member of the NAS of Ukraine. Since 2006 Prof. V. Chekhun is the Academician of the NAS of Ukraine. He initiated a series of the studies aimed at elucidating the biological features of tumors with different drug susceptibility. The in-depth study at subcellular and cellular levels provided the opportunity for identifying the factors underlying the apparent discrepancy between the mechanisms and biological effects of cytostatics in sensitive and resistant cancer cells. The results obtained provide the insights into the biological features of cancer cells underlying the varying sensitivity to chemotherapeutic agents. In particular, it has been proved that cell resistance to cytostatic agents is realized via the disbalance in the pathways of signal transduction and the intensity of the oxidative phosphorylation in interaction with glutathione system of detoxification. At the turn of the century, the intensification of the efforts in cancer research required understanding the genetic and epigenetic mechanisms in generation of the phenotype of the resistant cells. V. Chekhun with his collaborators demonstrated the role of impaired DNA methy­lation and altered expression of microRNAs in generation of phenotype of drug resistance. The molecular profiling of resistant cancer cells was provided for delineating the epigenetic alterations contributing to drug resistance. The analysis of the impairments in steady-state DNA methy­lation and alterations in the expression of micro-RNAs in resistant cells are of paramount importance for the modern pharmacogenomics that opens the new horizons for personalized monitoring of sensitivity to anticancer drugs and prediction of treatment outcomes. As a scientist of permanent creative endeavor, V. Che­khun perceives deeply the novel trends in science implying that the state-of-the art technologies aimed at the precise targeting of cancer cells and personalized treatment programs with the maximal sparing of the system of antitumor resistance represent the key points in modern approaches for cancer treatment. He was the first among the Ukrainian scientists who initiated the innovative research of molecular mechanisms of interactions, transport and transformation of nanoparticles in the biological complexes as the starting point for the novel strategy of the targeted transport of cytostatics to the tumors. Based on this research, Ferroplat composition has been developed that may be promising anticancer agent intended for overcoming drug resistance. Prof. V. Che­khun put forward the novel approach for studying the role of metalloproteins in pathogenesis of cancer. Prof. V. Chekhun authored more than 600 scientific papers on various aspects of cancer research contribu­ting much to both national and international storehouse of knowledge. The theoretical and experimental innovative research of the Institute underpinning the knowledge of the nature and mechanisms of tumor heterogeneity are of much importance for further identification of the novel prognostic and predictive markers and detection of the specific targets. All these studies are fundamental for the novel paradigm of personalized treatment of cancer. Prof. V. Chekhun has received numerous awards for his achievements. He is the Honored Master of Science and Technology of Ukraine. Vasyl Chekhun was awarded the State Prize of Ukraine in Science and Technology and the memorial R.E. Kavetsky Prize of the NAS of Ukraine. In the scientific and medical community focusing on the problems of modern oncology, he is known as the creative personality and the researcher with the broad range of scien­tific interests who followed the philosophical approach to the topical scientific problems. Prof. V. Chekhun combines his research with tremendous public activities. He is known by his uncompromising stand in the numerous public speeches, interviews and comments in the mass media highlighting the key problems of the scientific community and public life. The problems of the healthcare reform in Ukraine and training of skilled specialists are today in focus of his concern. The prominent professional skills of Vasyl Fedorovych are accompanied by his outstanding personal traits, his commitment to his life-work, the organizational skills, the leadership potential, and enthusiasm. Among his personal qualities is the deep respect for his Teachers, for those who contributed to his career choice and supported his scientific activities. And today Prof. V. Chekhun takes care of the creative generation of young scientists as the cornerstone of the success in the development of cancer research in our country. He is a founder of the potent scholar school focusing on the molecular basis and medical-and-biological problems of drug resistance. The birthday of V. Chekhun coincides with another remarkable date. Twenty years passed since Prof. V. Chekhun has taken the charge of the Institute and headed the Editorial Board of “Experimental Onco­logy”. And over this time, as Director of R.E. Kavetsky Institute of Experimental Pathology, Oncology and Radiobiology of the NAS of Ukraine and Editor-in-Chief of “Experimental Oncology”, Academician V. Chekhun devotes his full energies to basic and translational research doing his best in realizing the huge potential of the Institute’s team in settling the challenging problem of cancer. The administration and the staff of the Institute, Editorial Board of “Experimental Oncology”, and all colleagues have a great pleasure to congratulate Prof. V. Chekhun on the occasion of his 60th birthday and to wish him good health, inexhaustible energy, long years of further activity as a scientist and new scientific achievements. We wish you, Vasyl Fedorovych, happiness throughout your life experience in your devotion of upmost importance to do your best in making the impossible possible.